How do you do? 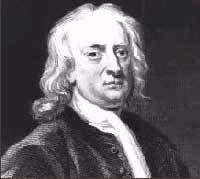 Sir Isaac Newton is my name, and I come from England. You may know my theory of gravity, which describes how the earth and other planets orbit the sun. I also discovered in my studies that the sun's light is made of many colors of light mixed together. This was quite a new idea at the time: that was about 1700. When sunlight passes from air to another clear substance, like glass, the light comes out as a rainbow, and this reveals the colors in the light. Why? Well, I still ask this question, no matter how much I know. But I would be happy to share my findings with you. To study light, I used a triangular prism of glass, like this. When light passes in through one side and out the other, it bends (it refracts) a little at each surface. The interesting thing is, the different colors bend by different amounts, and this is what makes the colors spread out, forming a rainbow. This picture shows how sunlight passes through a prism, bending a little as it goes in, and a little more as it comes out. The same thing is happening when rain droplets make rainbows. The light is spread out by passing through many small droplets. The resulting color separation, called dispersion, spreads the light across the sky. To Do: Another word for this dispersed, spread-out beam that shows all the colors of light is a spectrum. Please write down a definition of this word for your friend Copernicus. Next: Here is something I don't know: we argued a lot in my time about what light is. Some thought was a vibration in space. I think it comes from a stream of particles that go off in space like tiny explosions. I stuck to my idea, but I never could really prove it. I'm sure I was right, but I wonder, what do people think now? I do want to know! So please click the Next button to continue your time travels and see what you can find out about this.